MacLeod Tartan Ribbon is available to buy in two types of ribbon . . . The first (see image below left) is available in 12mm (approx. 1/2") and 38mm (1½") widths on 50 metre (approx 55 yard) bulk reels. The MacLeod Tartan Ribbon sold by tartan-ribbon.com is quality, authentic Scottish tartan ribbon and is manufactured in the United Kingdom. Please note that tartan ribbon supplied 50m bulk reels is from a different manufacturer than the tartan ribbon we supply on 25m reels and stocks are limited. The ribbon is very slightly thinner quality but these 50m bulk reels offer unbeatable value for money. The second version (see image below centre) is MacLeod "Taffeta" tartan ribbon, available in 10mm (3/8"), 15mm (approx. 1/2"), 24mm (1"), 36mm (1½"), 48mm (<2") and 72mm (2¾") widths on 25m (27½ yard) reels). Taffeta tartan ribbon is a finer-weave has heat-sealed edges and is cut from wider material, so each reel will show a slightly different part of the tartan. Please note that these are currently the only MacLeod Tartan Ribbons produced. 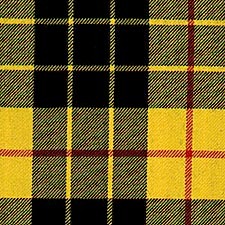 There are many variants of the MacLeod Tartan - this is the famous MacLeod of Lewis (registered 1842) or MacLeod of Lewes variant, also referred to as the Dress MacLeod, based on the MacLeod Snuffbox (registered 1829) and popularly known as the "Loud MacLeod".